We woke up around 7:00a to begin hiking what many have told us is one of the most popular hikes in Glacier, Grinnell Glacier. Seven in the morning is still late compared to our recent routine, so we felt refreshed. We made cheesy eggs, packed a bag, and set out to the lodge to find out if Ted received a tracking number for his wheel. Unfortunately, Ted got an email saying, “We dropped the ball!” explaining that they accidentally shipped the wheel UPS ground (!) and due to the holiday, the wheel is not scheduled to arrive until Monday (!!). This means we won’t be able to leave until Tuesday, putting us five days behind schedule if everything works out perfectly, which it may not, based on what we’ve heard about Many Glacier’s one-day package delivery lag (!!!). So, as happy as we are to be in the most beautiful place on earth, it’s not fun to be trapped here and use up every single one of the rest days we’d planned for the entire trip. We began hiking, a little downtrodden, but determined not to let it ruin our day. We spent the beginning of the hike trying to convince ourselves that this wouldn’t put us irrevocably off pace. Ted did some math and figures that we’ll have to cycle an average of 116 miles a day for eleven days in order to arrive in Minnetonka to visit my family on the date we planned to visit. This seems impossible to me right now, but Ted, optimistic as ever, thinks we might actually be able to do it given the flat terrain and prevailing easterly winds in eastern Montana and North Dakota. We really want to pedal the entire way home, but we might need to make some sacrifices. Visiting my family in Minnetonka adds two days to the trip and heading up to the Upper Peninsula in Michigan rather than taking the Lake Michigan ferry adds three days. These are two of the big highlights of our trip, so we’re going to pedal hard and long to avoid missing them. If we’re not making good time through eastern Montana and North Dakota—which we figure will only happen if we face headwinds, injury, or bike trouble—we are considering jumping on the Amtrak for a couple hundred miles through boring parts of North Dakota. This is a last resort! What’s the point of pedaling coast to coast if you’re going to cheat? Anyway, back to the hike. This was the most spectacular hike I’ve ever taken. Mountains carved by glaciers are unlike anything I’ve ever seen. 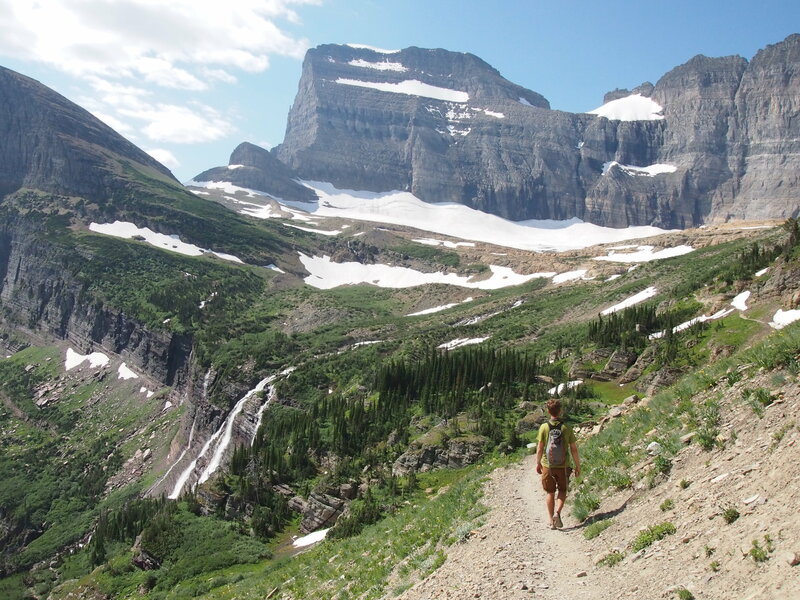 Glacial mountain ranges are characterized by U-shaped valleys that are lush and green at the bottom because of all of the snow / glacier melt, with layers of glacier-carved rock above the tree line and jagged ridges at the top. 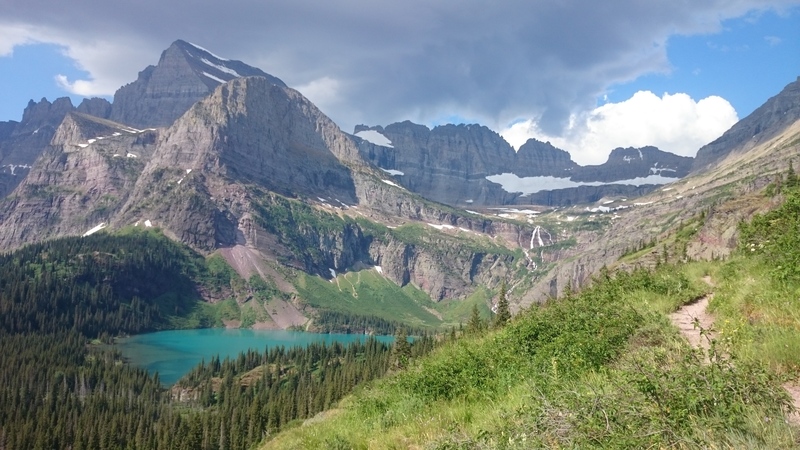 They are stunning and everyone should make their way out to Glacier to see these mountains while there are still a couple glaciers left (I think I read somewhere that there are only 21 glaciers left here as compared to 150+ a hundred years ago, but those numbers might be wrong). 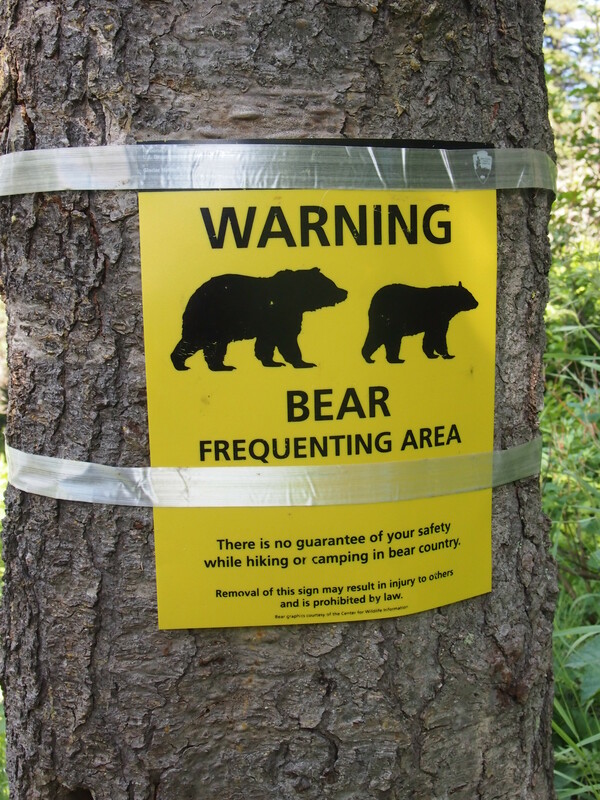 We started by hiking through a wooded forest and came across a scary sign after about a mile with a picture of a grizzly bear and a black bear that let us know that we were now in a bear frequenting area and our safety was not guaranteed, so we sang and talked loudly to let the bears know we were coming. Ted also reminded himself how to use the bear spray and accidentally deployed some (now we know it works! ), and kept it in his pocket for the hike. 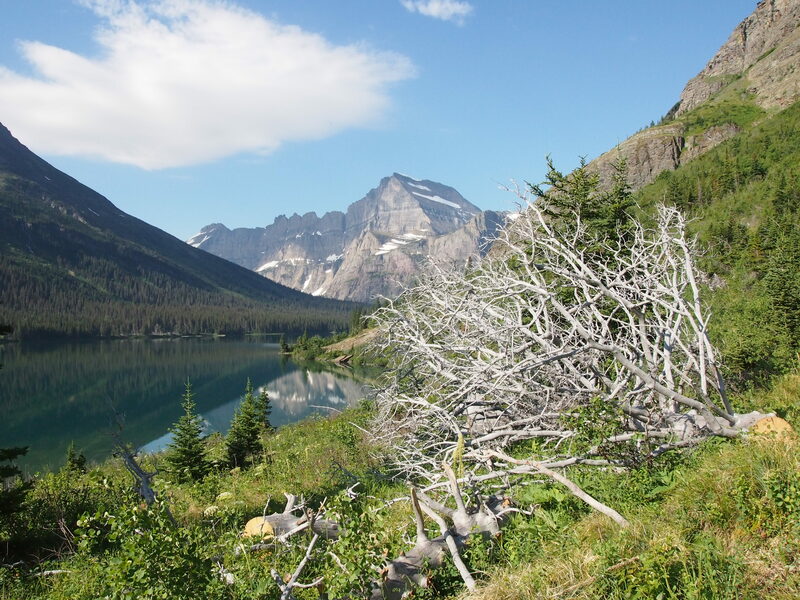 Once we left the densely wooded part of the forest, we hiked past Lake Josephine, yet another gorgeous turquoise mountain lake, and had mountain views all around. 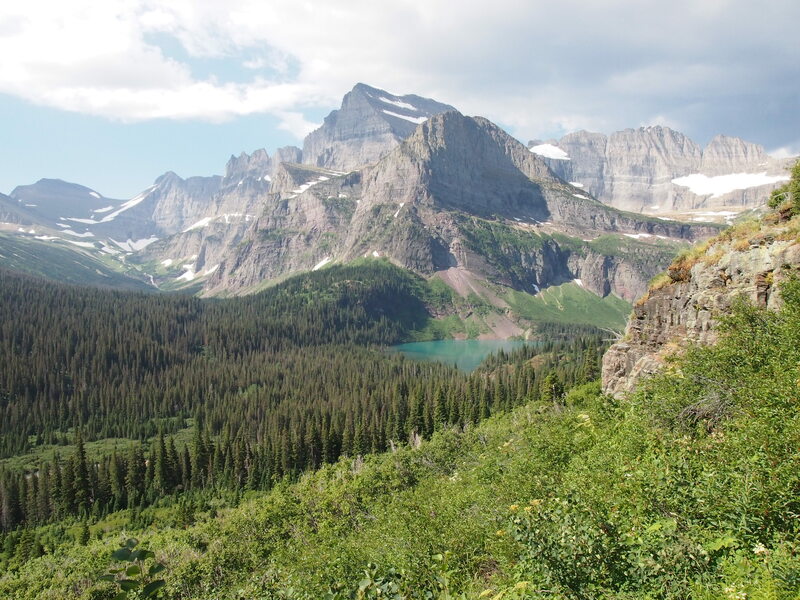 We then approached Grinnell Lake, which was equally beautiful. It’s wildflower season, so there were plenty of flowers in the grass. It couldn’t have been more beautiful. We only saw two other groups on the trail on the way up; apparently people get a late start around here. There was a very cold waterfall falling straight onto the trail, so we got a refreshing break a little over halfway up. We crossed paths with a couple marmots when we reached the top, our first non-deer wildlife sighting of the trip. After rounding a corner, we came within about 30 feet of six bighorn sheep snacking on some grass. 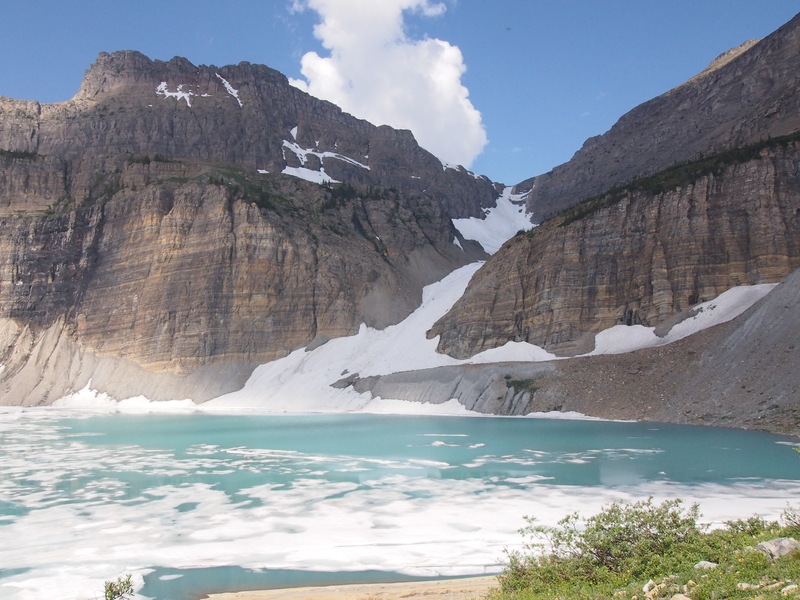 The end of the hike, Upper Grinnell Lake / Grinnell Glacier (the melting glacier is pooling up to create the lake), was spectacular. The water in this lake is the color of Gatorade Frost, with glacier all around. We felt like we’d entered another world! We were just below/beside/surrounded by the Continental Divide. There was a nice couple from Baton Rouge, LA sitting by the lake who offered to refill our water bottle using their filter. The water was ice cold, as you can imagine, and we figure it must be some of the purest water on the face of the earth. We sat there for a bit, eating limited edition cinnamon roll-flavored Pop Tarts, watching five other bighorn sheep playing on the glacier, and drinking our fancy cold water. Some clouds started rolling in and it looked like it was raining down the valley, so we figured we should head out since we didn’t bring rain jackets. On our way down, we came across a herd of 15 more bighorn sheep. They were everywhere! We crossed paths with a ton of glacier-bound traffic and were grateful that we got such an early start, enabling us to walk up in solitude. Plus, the views were almost completely blotted out by the clouds and fog that had rolled in, so things weren’t nearly as majestic for the latecomers. We caught back up with the couple from Louisiana (Kyle and Cassie) and hiked the rest of the way down with them. They told us about some of their previous and upcoming travels and we added items to our growing list of places to visit. The world is too big and wonderful! We got back to camp, drank some chocolate milk and ate Hostess cupcakes (as we do), did a few things on the computer, cooked dinner, showered, and crawled into our tents to read ourselves to sleep. Also, in an effort to clear out our pannier pantry, we melted old chocolate and peanut butter together and threw in some stale trail mix and peanut butter-filled pretzels to create trail mix bark. We’re letting it cool overnight for delicious desert tomorrow. Sorry to hear of the wheel woes. I hope you’re rolling soon! I’ve been touring with you vicariously through your blog. Great trip, great photos! Thanks Mike! We’re glad you’ve been enjoying the blog. The wheel is supposed to come today. We’re constantly refreshing the UPS tracking page and wondering why the wheel hasn’t moved from the town two hours away since 7am this morning. We’re anxious to be on the road again!